If you love scrapbooking, you understand how important it is to embellish your pages. Did you know that you can use a scrapbook sewing technique to embellish your pages? Who knew?! Use your sewing machine to create amazingly creative embellishments in a very short amount of time. Utilizing your favorite scrapbook sewing technique will enable you to create wonderfully decorative and unique scrapbook pages. The first rule of thumb to remember, when using your preferred scrapbook sewing technique, is to always use card stock. Card stock is sturdier than other papers are and is highly durable. Using card stock ensures that your design will be transferred accurately and will be long lasting. In fact, even if you’d like to stitch on a lightweight paper, it is recommended that you back up the piece with card stock and then perform your stitching. When beginning your scrapbook sewing technique, you’ll discover that you can choose to stitch with or without thread. Yes, I said without thread! The idea of stitching without thread may seem strange at first, but you’ll quickly realize how beneficial this scrapbook sewing technique is. When stitching without thread, you’ll be able to make decorative designs by punching holes. You can create simple patterns, use a straight stitch, or if your sewing machine has stitches such as a zigzag you can make interesting designs. Take a look at quilting books with quilt design templates. You can make a copy of the quilt design and lay the copy over your cardstock. Then, punch holes through both papers. When finished, remove the template and find a beautiful punched design on your cardstock. No matter what stitch you use, you can stitch around the borders of your pages, or around certain elements that you would like to highlight for a fantastic effect. If you decide to use thread, it is important to choose the right kind of thread. You will find that embroidery thread is the best choice for your projects. Embroidery thread is durable and built to last for centuries. You can choose to stitch by hand as well, however, you’ll find that the sewing machine creates wonderful results in a fraction of the time that it would take to hand stitch your projects. Additionally, when using the sewing machine, remember to stitch only the piece that you are working on. Stitching small sections is much simpler and more effective than trying to stitch full-length pages at once. However, make certain that you never actually stitch directly on a photo, stitch around photos and create borders instead. 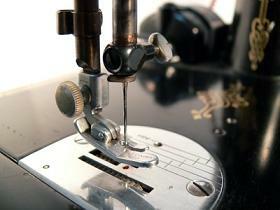 If you are not an experienced seamstress, don’t worry. You don’t have to have lot of sewing experience to master this versatile scrapbook sewing technique. Sticking with simple designs is a great way to master the art and discover that by using simple stitches creatively, you can create amazing pages that look as if they took many hours to create. Another idea is, after stitching, trim the paper in the shape of the border that you’ve created. This adds movement to the piece and gives the paper a unique look. By using decorative threads and choosing materials for your accents, you’ll find that you are only limited by your imagination, and with a little practice you’ll be creating stunning embellishments that will wow and impress. Always remember to practice your design first on a piece of card stock, before trying it on your scrapbook page. I am sure that you will agree that this scrapbook sewing technique will add wonderful embellishments to your projects. Click here to see one of my scrapbook pages using the sewing technique! Showcase the scrapbook pages that YOU have created using the sewing technique! Click the button and find your scrapbook file on your computer. Then select it.